Metaliteracy and me -- we're tight. I don’t think metaliteracy should be elevated by name to the extent that it is in the new draft ACRL Framework for Information Literacy for Higher Education. This draft was made available yesterday to the profession at large, with an invitation to comment and provide feedback on the important work the task force, charged with developing this document, has completed thus far. Formal feedback should be offered through a SurveyMonkey instrument the task force has set up for this purpose, but informal discussion of the document has already begun on Twitter. See #ACRLILRevisions, #futureofIL, and #infolit tweets timestamped February 20th for some of this conversation, though many of the exchanges are occurring without hashtags, making tracing the conversation there a challenge. Before I continue, I want to say that I am incredibly excited by the draft, and I believe the task force has done incredibly good, but challenging, work on a gargantuan task. I am grateful to them for developing the living, dynamic framework for IL that our profession and others who will use the document deserve, and also for their graciousness and wisdom in inviting librarians and other stakeholders to offer critical and (at times) uncomfortable feedback on their work, with the goal of making it better. For all of this, they have my sincere thanks. In short, many folks are not sold on metaliteracy as a necessary “anchoring element” (draft, p. 6) for this new IL framework. Metaliteracy is presented alongside another new mode of understanding IL, through the use of threshold concepts, where “metaliteracy” and “threshold concepts” appear to be weighted equally as influential lenses and underpinnings of the structure and content of this new framework. Leading up to this draft, there has been anxiety surrounding both of these new-to-librarians terms, since the task force shared with the profession last fall that these two ideas would be very influential in the drafting of the document. Along these lines, click here for a snapshot of some of the Twitter conversation related to the problematic nature of naming metaliteracy and giving it such weight within the document. My proposed solution, both in that Twitter conversation and here, is to integrate metaliteracy into this new IL framework without naming it. After completing a thorough read-through of the draft, I now feel even more confident that this is the best way forward for the document, and the task force charged with developing it. Here below is my case for this recommendation. First, I should clarify: I don’t suggest removing the word metaliteracy from the document entirely. Trudi and Tom have done such extensive work on metaliteracy, and very good work that connects metaliteracy to information literacy, in case any of the naysayers have yet to actually engage the concept as articulated by them and others. And I’m not just saying this as a metaliteracy fangirl: I really mean it. They have described something that is so evident, to me at least, as someone who has used social media as a pedagogical tool in the classroom for five years now, that it just is: it is our reality today, both in terms of the information environment we all find ourselves in, and also in terms of the needed responses to this environment -- metacognitive reflection, and a critical awareness of why we do what we do with information, being the foremost of these. This is important work, and it should be recognized in the parts of this new IL framework that directly draw upon and are influenced by metaliteracy as it has been articulated by Trudi and Tom. That being said, as I read through the draft, I detected as I went the growing sense that, while threshold concepts are fully fleshed out in terms of their connection to and usefulness for the work of information literacy, to the extent that they are the organizing principle of the document (each section of the framework is identified by a threshold concept for IL)...while this was the case for threshold concepts, it did not feel the same for metaliteracy as a self-referential “thing” that needs its own categories, justifications, and objectives within this new IL framework. The first place I noticed this in the draft was in the extensive introduction to the framework. The section titled “A New Framework for Information Literacy: Using Threshold Concepts” (pp. 5-6) is very fleshed out, provides a clear and compelling rationale, connects the concept to other disciplines, and is 1.25 pages long. Immediately following this section is another section titled simply “Metaliteracy” (p. 6) which, based on the expectations set up by the section about threshold concepts, I was expecting to provide a similarly compelling and detailed rationale for this second “anchor” situated alongside threshold concepts. The “Metaliteracy” section of the introduction, however, doesn’t provide this; instead it provides 1/3rd of a page of text that articulates the important and useful elements of Trudi and Tom’s articulation of metaliteracy that we can expect to be incorporated into the framework that follows. The second place I noticed that metaliteracy feels a bit tacked on while yet articulating important things (more on this later), is in the structure of each Threshold Concept for IL -- three of which have been offered to us in this draft for comment, though my understanding is that the final framework will have upwards of ten threshold concepts for IL identified, defined, and fleshed out. Each Threshold Concept for IL includes the name of the concept, a definition (in bold), a more detailed description of the concept, Knowledge Practices (Abilities), Related Metaliteracy Learning Objectives, Dispositions, Self-Assessments, and Possible Assignments/Assessments. 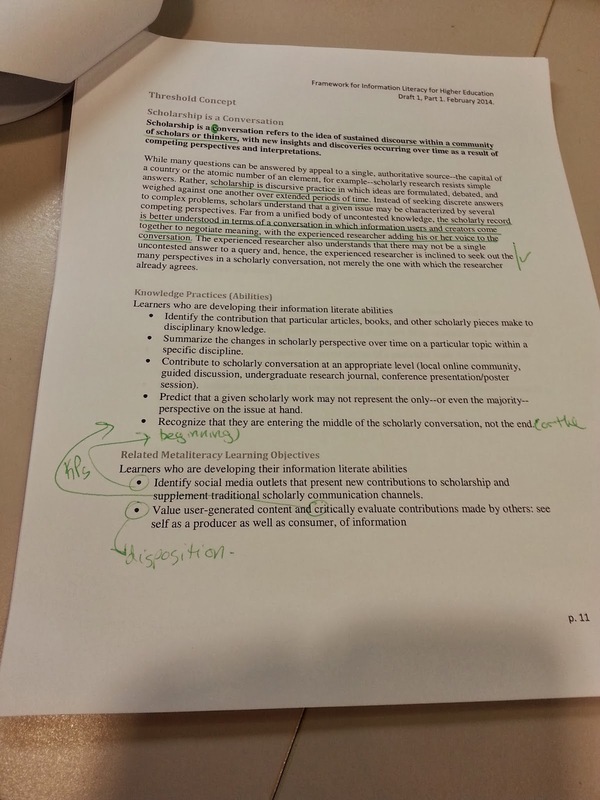 As a first-time reader of the document, reading through one sample Threshold Concept for IL, when I reached the “Related Metaliteracy Learning Objectives” they felt redundant in terms of the purpose of the separate sub-section/list -- these learning objectives can in every instance be integrated into either Knowledge Practices (Abilities) or Dispositions, either as discrete additions to those lists, or as added nuance to items already included on those lists. The only reason there would need to be a separate list of “Related Metaliteracy Learning Objectives” is if metaliteracy remains a “thing” unto itself in this framework -- the way threshold concepts are. I no longer believe it should be. But where does that leave us? Do we throw metaliteracy out the window, along with the baby (i.e., metacognitive reflection on one’s information attitudes and practices) and the bathwater (i.e., the complex information environment we find ourselves in, replete with participatory information environments wherein information seekers are now also content creators, curators, and sharers)? No, of course not! So what do we do? My suggestion, as someone who has heavily engaged and applied metaliteracy as articulated and developed by Trudi and Tom, is to articulate in the framework’s introduction the parts of metaliteracy that are absolutely vital to information literacy today, and then to integrate/incorporate/embed these elements heavily and explicitly throughout the Threshold Concepts for IL sections -- without feeling the need to identify these elements as “metaliteracy” every time we do. and which in turn require, now more than ever, the learner’s development of “metacognition, or consciously reflecting on one’s thinking” as well as “multiple domains” of learning, including “cognitive, metacognitive, affective, and behavioral” (draft, p. 6), in order to negotiate and thrive in these new roles -- in addition to the more traditional roles of one who identifies an information need, and then accesses, evaluates, and uses the needed information effectively and efficiently (ACRL 2000). 3) learners develop greater and deeper metacognition related to their own information attitudes, behaviors and practices, in order to constantly improve and strengthen their ability to thrive in this new environment. By so doing, they develop into information literate learners. It is a three-part argument, metaliteracy is, though of course there are many implications associated with each part of the argument, which Trudi and Tom have developed extensively in their 2011 C&RL piece, and which have been incorporated into the Metaliteracy Learning Objectives the task force has at present included in the draft as a set of lists separate and apart from the Knowledge Practices (Abilities) and Dispositions for each Threshold Concept for IL, as I described above. But to me at least, these three assertions I've just outlined as the "argument" of metaliteracy are the key contributions that Trudi and Tom's work on metaliteracy has to offer to this new IL framework. As such, my suggestion to the task force is to remove metaliteracy from its elevated position as an “anchoring element” in the framework, and instead incorporate it into the overall literature review, drawing on Trudi and Tom’s work to articulate the above aspects of metaliteracy that any new IL framework today needs to address. Leave it in the glossary, since it is a relatively new term to librarians and others who will be using the framework. But -- and this is key -- analyze all of the Related Metaliteracy Learning Objectives associated with each Threshold Concept for IL, and deeply embed them in either the Knowledge Practices (Abilities) or Dispositions for each threshold concept, doing away with the separate list of Related Metaliteracy Learning Objectives altogether. In several cases, this will require deconstructing the Related Metaliteracy Learning Objective in question, since many of these objectives intentionally include both abilities/practices and dispositional elements... And this is precisely what makes their presence as a separate list/entity so confusing to the reader of this new IL framework document: on the one hand, the document seems to want to distinguish abilities from dispositions (a useful distinction, in my opinion), but on the other, there is this list of “Related Metaliteracy Learning Objectives” that contains objectives that intentionally combine abilities and dispositions. This makes putting into practice these Threshold Concepts for IL difficult and more complicated than it needs to be. More fully integrating the elements of metaliteracy that are vital to information literacy, and doing away with the separate lists of Related Metaliteracy Learning Objectives, makes for a stronger framework overall, and as a bonus will serve to un-alienate those members of our profession whose “unnecessary jargon detectors” have been going off like mad ever since the task force articulated the direction the revised framework would take. It's a win-win. I love this kind of work -- integrating one set of ideas deeply and tightly into another set, making the resulting set so much stronger than either set was on its own. And it is the work I challenge the task force -- co-chaired by Trudi, no less, which positions her to lead boldly in this work of integration -- to do, to make the final version of the framework as strong as it can be. I am so excited for the #futureofIL. Let's do this.